The chefs have received a compassionate, but extremely pointed, critique by dad. “Be yourself, that’s when you cook the best.” As they slump back to the stew room, Padma surprisingly joins them. “I think you all could use a break,” she notes slyly. The chefs cautiously nod in agreement. 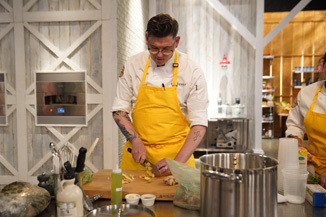 On Top Chef, every benefit comes with strings attached. For today’s episode, not only will we be forgoing a Quickfire (no immunity up for grabs), we’ll be hitting the road. Lake Cumberland—a few hours away by car—is the houseboat capital of the world. Thus, with nine chefs left in the competition, we’ll be doing a version of Restaurant Wars—call it, Houseboat Wars. The chefs will split into two teams and throw two dueling houseboat parties for 100 lake-goers. At the end of both parties, guests will get to vote for their favorite, and the team that gets the most votes will be safe. As the winner of last week’s challenge, Eddie not only gets to choose his team, but whether to have four total members on the team or five. Perpetually nervous as a Chihuahua, and sensitive to team dynamics, this is a privilege that Eddie would prefer to decline. Employing no strategy whatsoever, Eddie simply starts naming people who fall within his line of vision: Adrienne, Michelle, David, and Brian. That’ll be his team (the Blue Team). The Green Team, comprised of the remaining chefs, is Eric, Justin, Kelsey, and Sara. As the teams start planning, a difference in their respective mentalities and approaches becomes apparent. The Green Team is the PAR-TAY team. They’re gonna make jello shots, they’re gonna make party favors, they’re gonna serve raw oysters . . . they’re planning on offering some serious adult fun for their partygoers. Two guesses which approach the guests are gonna enjoy more. The chefs get to the boats and take a stroll around—though outfitted with hot tubs and massive slides, the kitchens are relatively small. Luckily, or maybe unluckily, the chefs can stay up as late as needed tonight to prep for the next day’s party. And the Blue Team is gonna need it, as they have a ton to do. So, of course, what should happen but the power goes out on their boat. The chefs try to grin and bear it, but their patience has limits. They try to do everything they can that doesn’t require power, and then using plug-in cooktops after that, but they can only keep doing this for so long. Things need to be seared, other things need to go into the oven. They keep checking with the mechanical team, who assures them that progress is being made, but no power, no power, no power . . . Finally, the Green Team lets the Blue Team come over and use their kitchen. It’s a much appreciated gesture. And finally, close to 3 am, power returns to the Blue Team’s boat. Now they can really get to work. As for the Green Team, they’ve had a jolly ole time. Sara has made their “jiggle juice,” aka jello shots, which contains a ton of a Maker’s Mark. Kelsey has made some party favors containing chef-y Chex Mix, which is sweet, salty, and delicious. The team has amply sampled both and are high spirits. As if things can’t get worse for the Blue Team, Adrienne is feeling really sick. Not seasick. But virus-laden, don’t-let-her-anywhere-near-the-food sick. She tells her team that she’s not going to be able to serve her dish today. Eddie volunteers to take care of her dish, and Michelle volunteers to help Eddie with his. Meanwhile, Brian hasn’t slept at all. The guests arrive and the Green Team is quick to greet them with cups of jiggle juice. The guests are highly appreciative. The judges soon follow. They are less enthused about it—Padma makes a face after trying it, finding it way too alcoholic. Elsewhere on the boat, Kelsey serves an Alabama-style raw oyster with cocktail sauce, lemon juice, and pickled watermelon rind. Emeril, our guest judge for today, loves her sauce. She also made her team’s party favor—a “lime crunch cereal” with white chocolate, banana, coconut, and key lime. The judges note how the offering just contributes to the overall fun and welcoming environment on the Green Team’s boat. Justin, her teammate, offers a watermelon salad with tequila marinated shrimp with basil croutons. It’s got great balance. Sara has a take on a shrimp roll, which incorporates trinity, tarragon, parsley, and meyer lemon zest on a brioche roll. Eric has some real trouble getting out his beer-battered and fried walleye with an escabeche sauce—the power for his fryer keeps shutting off and so he has to fry off his fish downstairs and then bring them back up for service. It’s worth it—his fish is hot and crispy. Over on the Blue Team’s boat, things are much quieter. David has a seafood dumpling with scallops, black bass, caramelized onions, and a spiced coconut broth. Nilou from Food & Wine Magazine, in place of Gail, wishes it had more heat. Brian, standing, carving, and serving his dish while in a hot tub—an idea that seemed good at the time, but appears to have drained his energy and left him lethargic—has his take on a porchetta with papaya and a peanut cilantro salad. While the flavors and textures of the dish are nice, Tom notes that the belly of the pork has separated from the loin—a sign that it has not been cooked properly. As for the Blue Team’s remaining dishes, Eddie is finishing and plating Adrienne’s salmon tacos with a corn salad, chipotle aioli, and red cabbage slaw. It’s very well received. For himself, Eddie has a take on shrimp cocktail, with a poached shrimp skewer with herb aioli, prosciutto, and fresh horseradish. Tom finds it wacky but nice. Finally, Michelle has a take on fish and chips with a potato chip-crusted Kentucky bass with an onion dip sauce. Tom can tell the fish was fried a while ago, as it’s not hot, but is happy that it’s still crispy. Service ends and all that’s left to do is tally the votes and let Adrienne stay below deck, as she’s still deathly ill. It’s a route—out of 100 diners, the Green (Party) Team garnered 79 total votes. They’re roundly praised by the judges. Justin’s watermelon salad is something Nilou would want at any cookout, and was perfect for the setting. Kelsey’s oysters brought the diners straight to Alabama and smartly cross-utilized the watermelon rind from Justin’s salad. Sara’s shrimp roll was up there with the best of the ones Emeril has tried, and Eric’s walleye dish was awesome, despite having some technical difficulties in getting it done. But between the cold raw oyster and the take home bags full of Chef-made Chex mix, Kelsey gets the win. She’s thrilled. The challenge fell into her wheelhouse—she does a lot of catering—and she won for cooking “her” type of food. Tom’s advice in the last episode was clearly well taken. Though it didn’t seem like the Blue Team did all that badly, especially given the massive amount of hours when they were without power, and despite being down one member due to illness, the judges really hammer the Blue Team. Michelle’s fried fish was crispy but cold. Eddie’s shrimp skewer felt bland to Padma, and Nilou compares it to something she’d make at a pool party, wrapping shrimp with some store-bought prosciutto. He did, however, do a very nice job delivering Adrienne’s salmon tacos to the diners, which were balanced, well-proportioned, and well-seasoned. While David’s seafood dumpling wasn’t bad per se, it just didn’t fit the challenge (or the hot weather). Nilou think he should have gone the pot-sticker route instead of a dumpling. And as for Brian, he gets slammed for his cooking of the pork. The brine he used on it lent a ham-like flavor, the separation of the belly from the loin was indicative of improper cooking, and the flavors he incorporated (lemongrass and papaya) were just off in terms of a porchetta. Given all that, it’s not a real surprise that Brian is going home today, which Tom attributes to him simply not cooking the pork correctly. Brian espouses pride in the way he competed on the show, saying he tried to push boundaries. But all that boundary-pushing was for naught, as he’s taken away in a speedboat. Meanwhile, Padma informs the rest of the chefs that they’ll be packing their bags again. This time, for Nashville.